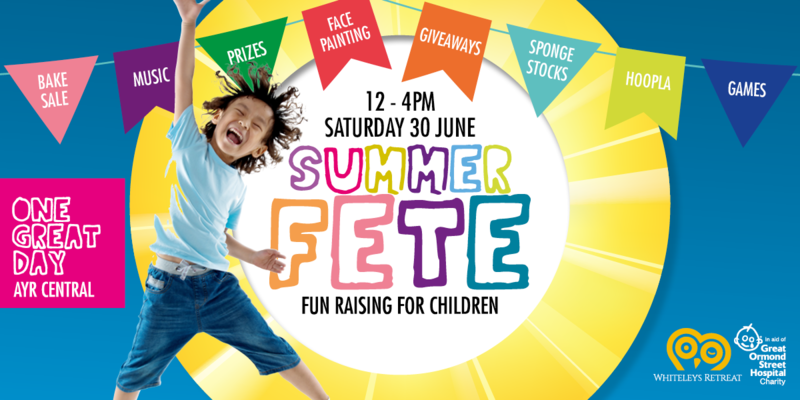 You’re all invited to kick-start the summer holidays at Ayr Central on Saturday, 30 June with the ‘One Great Day’ summer fete. Bring the whole family and enjoy all the fun of the fete in our summer Central Park, there’s balloon modellers, music, face painters, side stalls, bake sale, giant games and sports challenges, not forgetting great prizes to be won! It’s all in aid of Ayrshire’s Whiteleys Retreat and Great Ormond Street Children’s Hospital. Enjoy ‘One Great Day’, have fun raising for children and make Ayr Central, central to your summer. Whiteleys Retreat is the result of the all the amazing work carried over the last few years by the team behind #BUYMSH. The facility in Alloway, Ayrshire, due to open this summer, will be providing therapeutic short breaks for children, young people and their families with cancer and life-altering illnesses in the UK. Great Ormond Street Hospital Children’s Charity enhances the health and well-being of children and young people, giving them the best chance to fulfil their potential. The charity provides funding for vital research to pioneer new and kinder treatments for rare and complex conditions. Over the next five years, they will increase investment, spending over £50 million.